A few weeks ago I met a very sweet couple from Norway, Lena and Knut, we sat opposite each other at a supper club and started talking. Days later I found out about their wonderful blog Teak Tray Weekdays where they share little treasures of their daily life in Trondheim and their traveling trips, I got peacefully lost in their stories. When Lena asked me if I would like to cook something together with them I was very happy. I liked the idea of the three of us cooking the same meal in different kitchens in different countries and with different recipes. I let them choose what we would cook and they suggested Bibimbap. They had just been to Berlin and enjoyed this Korean speciality at a restaurant so much that they wanted to cook it at home. 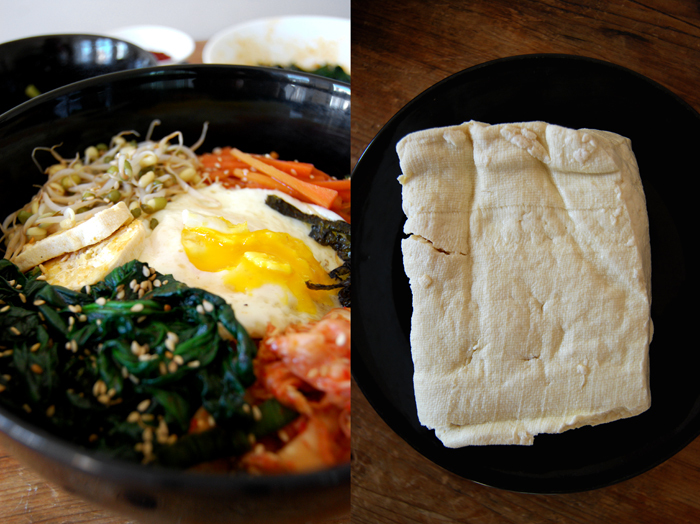 You can find the link to Lena’s and Knut’s Bibimbap here. At first, I wasn’t sure about my approach to this meal. I had never cooked Korean before and I usually need an experience, a memory, a story, taste, something that opens the door to a new culinary experience. I asked my oldest friend Yu-Kyong for help, we lived next to each other through our whole childhood, she has Korean roots, her father grew up in North Korea and her mother in the South. 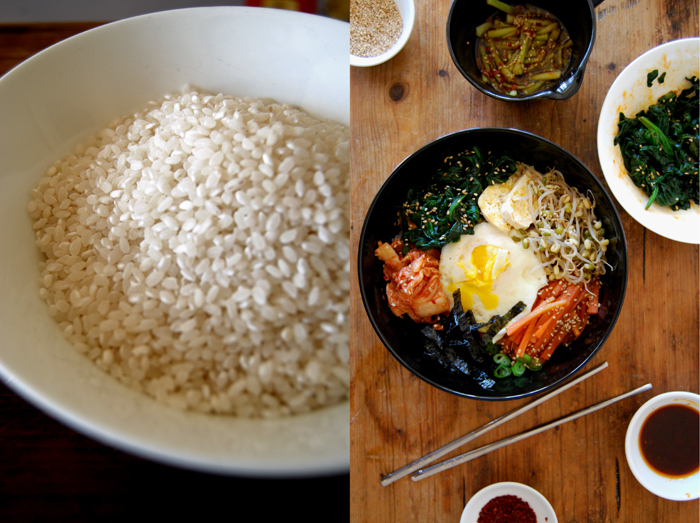 She lived in Germany all her life but her mother cooks Korean for the family and introduced her daughter to the traditional recipes, like Bibimbap. When I asked Yu-Kyong to write down the recipe so that I could buy all the ingredients she told me that this wouldn’t work, we would have to go shopping together! We met at an Asian market and she gave me an introduction to Korean cooking. She explained the necessary spices, mixtures, spice pastes and preparations to me, all in between hundreds of boxes, tins and bottles of food, freezers stuffed with tiny crabs, octopus and fish. The scent of a different world in my nose, visually overwhelmed, I tried to keep up with her. She told me about the different flavours and qualities of sesame oil, I learnt how to cook sticky rice properly, which cutlery I have to use (a metal spoon and metal chopsticks, not wooden!) and so much more. Basically, a one hour crash course on Korean cooking, in the middle of an Asian market, typing everything more or less precisely into my phone, not to forget a single detail. I got home with bags of vegetables, Kimchi, roasted seaweed, Obok Gochujang hot pepper paste, many colourful tins and boxes. I bought the first tofu of my life and I felt happy and finally prepared for this new cooking experience. Here’s a quick description of Bibimbap, it’s a one pot meal, rice at the bottom and steamed vegetables mixed with a sesame oil and soy sauce dressing on top. I steamed spinach, sprouts and carrots and added strips of seaweed, Kimchi (spicy fermented cabbage), fried tofu and eggs. 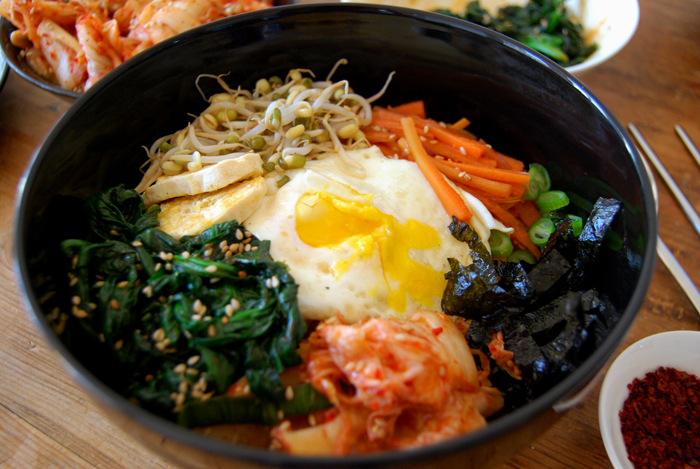 The spinach is glazed with the special Bibimbap Gochujang sauce which is mixed into the rice as well. I made a traditional cucumber salad on the side, mixed with sesame oil and soy sauce, sprinkled with chili powder and toasted sesame seeds. This meal needs good preparation before you mix everything together, it’s a ceremony of pure tastes mixed with the strong flavour of good quality sesame oil and the spiciness of Gochujang. 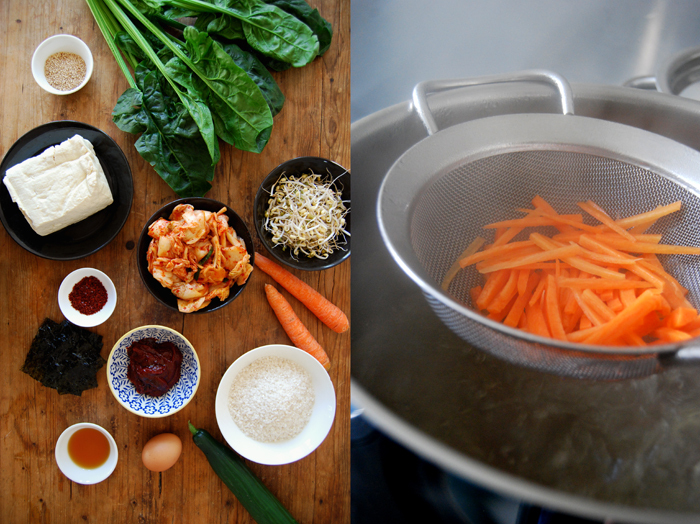 When you make your own Bibimbap you should allow some extra time to enjoy the cutting, steaming and mixing, it’s meditative. I learnt that this is not a warm meal, the rice and egg (which I fried in the end) have to be warm but the steamed vegetables can be cold. Cook the rice in a pot filled with water and a pinch of salt (the water should be 2cm / 1″ above the rice) for 12 minutes, on medium heat, keeping the lid closed. If the rice is still hard and didn’t soak all the water, keep it on the heat for a couple more minutes. When it’s done, keep the rice covered and set aside. 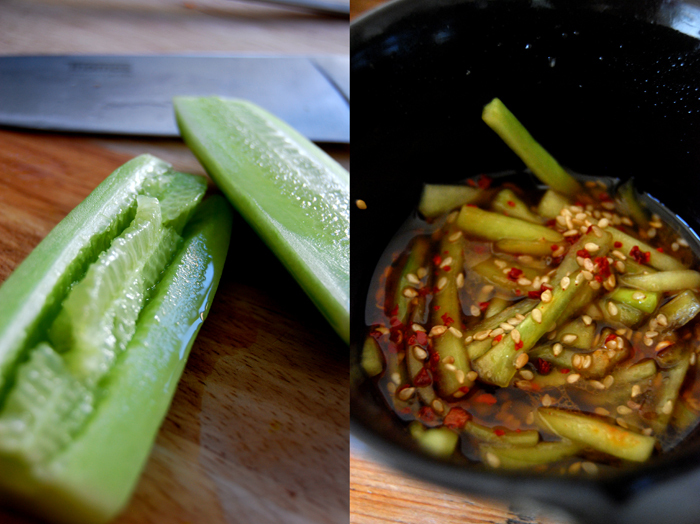 For the salad, cut the cucumber into strips, mix with 1/3 of the dressing (not the Bibimbap sauce) and sprinkle with some sesame seeds and the dried chili spice. The cucumber salad is served as a side dish, not on top of the Bibimbap like the rest of the vegetables. Glaze the steamed soybean sprouts with 1/3 of the dressing (not the Bibimbap sauce) and the steamed carrots with the rest of the sauce, sprinkle both with sesame seeds. 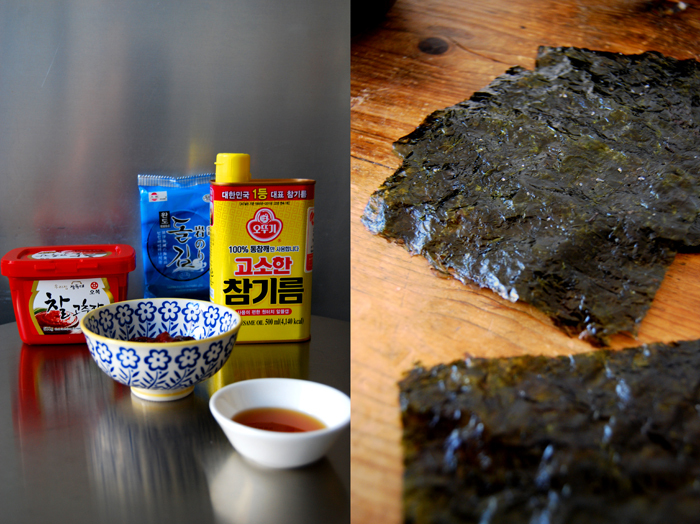 Mix the steamed spinach with 4 teaspoons of the special Bibimbap sauce (keep the rest of the sauce to mix with the rice). Fry the tofu in a little sesame oil for 2 minutes until golden, turn gently and fry on the other side. When it’s done, set it aside. Fry the eggs, leaving the egg yolk soft. Put the rice in a large bowl and the spinach, carrots, sprouts, Kimchi, spring onions, tofu and seaweed on top, arrange them in a circle next to each other. Place the fried eggs in the middle and sprinkle everything with sesame seeds. When you serve the Bibimbap at the table, you can either mix everything in the bowl together with the rest of the Bibimbap sauce or divide it between the plates and add some sauce to it (that’s how I did it). I love Bibimbap! I used to eat it often in Korean restaurant, and tried to make it by myself, but I didn’t exactly know about the authentic method of preparation. I wasn’t sure which Korean sesame oil and Gochujang to get at a Korean grocery store, but now I know that, too (thanks for the photo). I’ll definitely try this. Thank you for posting. Your photos are so beautiful, and your writing makes me want to cook! Thank you Kyoko! 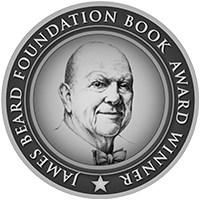 I’m happy that my photos and writing are an inspiration for others to cook! That’s the biggest compliment I can get and definitely what I had wished for when I started eat in my kitchen. 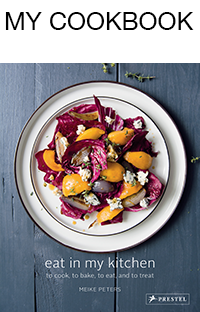 I love cooking (and eating) and it’s great when this passion jumps on to others. I decided to post the photo with the sesame oil and Gochujang because I thought that I wouldn’t be the only one feeling lost in a Korean grocery store, I needed my friends help to find the right products! Thanks to Yu-Kyong I managed! Please let me know when you tried it, I’d love to know your opinion! I haven’t had Bibimbap in ages and forgot how much I love it. This looks amazing and I can’t wait to try it. Your photos are beautiful. Thank you Amy! It tastes so good, it was my first Bibimbap ever and I loved it! I wouldn’t have managed without my friend’s help, her recipe and introduction to Korean cooking. I really enjoyed this new cooking experience, the spice mixtures, the cutting and steaming, it was very meditative! Please let me know when you try it!